The rain stopped just in time for the show. Quite nice, we parked 3 times. It took 2 hours. It was a daytime stroll which was nice, no struggling in the dark, a great thing for architecture tourists. Click the lower right corner of the slide show to make it full screen (and escape to shrink it). I 'd like these art strolls to help their guests find each gallery. This one had a great flier but red balloons at each gallery would have helped. If it was dark we'd need a flashlight to follow the map (a problem at Avondale's and Castleberry Hill's evening shows. Congratulations to the West Side Gallery folks. We're looking forward to the next one. Julia over at Hooked on Houses is hosting her "Hooked on Friday's" blog party. This is my third try. To me, the scale and the detailing produce the charm. The eye is happy looking everywhere. It takes a lot of effort, time, and money, to make it look effortless. So many details: We see plenty of gambrel roofs in Dutch colonial homes. Whatever the practical effect, the psychological effect of a gambrel room is a more "grounded," approachable home. The prominent, center gable isn't typical Dutch colonial here. But it is typical of the Cape Dutch Style. That is, in colonial South Africa. The gable details: the arched window with a prominent keystone, and almost Gothic real shutters. The balustrade is a Georgian feature I think. Both center and end gables are not only gambrel, they curve. The curve evokes a thatched roof. Also a Cape Dutch feature. have you ever seen an 8 over 12 window? You can't even special order them at Home Depot. You only get this with great owners, great architects, and great budgets. We're not done with windows yet. The 1st floor windows have prominent entablatures. You can't praise real shutters enough, the angles and the shadows keep the eye moving and pleased. We layman enjoy the shadows without understanding how important they are to artists and architects. Shadows are in play everywhere in the details. More shadows in the eaves, overhangs, and thick clapboards. the sheltering gambrel roof, the porch roof and the 2 tiny steps say welcome, come in out of the sun or rain. Let's go back and look the horizontals and verticals. I don't have the right words; so let's just do a little silent study. I don't understand the visual effect of the chimneys but they seem to doing their job. Are they visually keeping the gables from falling off the ends of the house? This house is bigger than it looks. This wing is pretty big but it doesn't seem so. It's not just that the landscaping hides the wing. It's as if the wing was added on sometime during the long life of the house. It has a different height, different roof line and different chimney. I don't now about you, but I can imagine this home adapting and growing to fit several families though several generations. That's what houses are all about. I salute the owners and architect. They could have taken the square footage, the mass, the materials, and the cash and made an intimidating mansion. Instead, they chose people-scaled charm. I understand that this was a rancher. 2-storied in the first major renovation. What we are seeing is the second major renovation. Of course this is only the street facing facade. I hope you see these in the slide show. Make sure to blow it up to full screen. If you are familiar with Flickr, see these in original size (2703 x 1857). Please pardon my amateur description. I'm studying. "Why is medieval and renaissance architecture so much better than our own?" "Greatest educator of the last 50 years? 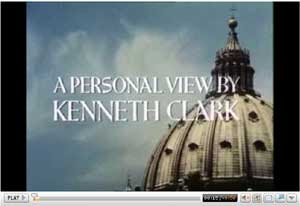 Well, the late Kenneth Clark has to be in anybody's Top Ten. His 13-part TV documentary Civilisation (that's the British spelling), first aired in 1969, is a marvel." John Derbyshire. Have you seen "Civilization" or read the book? I don't think there is an easier or more serious way for architecture tourists to begin an armchair study of art history and why it matters. The series is now 40 years old and like the art it stands the test of time, so far. We can now watch several episodes online. The one on my mind right now is "Grandeur and Obedience." It's about the Baroque era: Michelangelo, Bernini, Titian, Caravaggio, and the breathtaking art and architecture commissioned by the popes of that era. Learn a bit about the design of St. Peters. "Of course there was exploitation before the 16th century but never on so vast a scale. In the middle ages it was usually accompanied by real popular participation... But the colossal palaces of the popes were simply private expressions of greed and vanity...These rapacious parvenus spent their short years of power competing as to who should build the largest and most ornate saloon. In doing so they commissioned some great works of art. And one can't help admiring that shameless courage. At least they weren't mean and furtive...But their contribution to civilization was limited to this kind of visceral exuberance. The sense of grandeur is no doubt a human instinct but carried too far it becomes inhuman. "I wonder if a single thought that has helped forward the human spirit has ever been conceived or begun in an enormous room." Civilization rewards repeated viewings. I hope you'll try at least on episode. If you can convince your children to watch, all the better. Thanks to "Things That Inspire" I went to the Institute of Classical Architecture & Classical America Southeast Chapter's 3rd Philip Trammell Shutze Awards last night at the Atlanta History Center. I was certainly among kindred spirits. Folks were gasping over the slides, me too. We gasped about the stunning beauty of the projects. We gasped over the budgets. Small Renovation: D. Stanley Dixon for a Dutch colonial renovation with a front facing center gable. Beautiful inside and out. One of my favorites. Large Renovation: Fairfax & Sammons for a Palm Beach estate. Big and high-style. The architects themselves were in awe. Small Addition/Restoration: Harrison Design Associates for a 1920's half-timbered, curved-roofed Tudor cottage. Even after the renovation Shakespeare would be at home there. Small? It's on Habersham Road. Large Addition/Renovation: Spitzmiller & Norris for restoring a Buckhead mansion burned in 2000. Just large? This one makes me proud to be an Atlantan. Landscape/Garden Design: Land Plus Associates for spectacular landscaping at a Buckhead estate. The project is new but looks like it's been there for 100 years. There are many garden "rooms." The garage / motor court is as beautiful as any park. Craftsmanship: Savannah College of Art and Design for restoring Ivy Hall, the Peters' Residence in Atlanta. SCAD promised that this wasn't their last project for Atlanta. Residential Interior Design: D. Stanley Dixon for a Georgian revival interior in Atlanta's Brookhaven . Elegance in the highest style. Mr. Dixon acknowledged Patricia McLean Interiors and Bonner Custom Homes. Small Institutional: Historical Concepts for the Greek revival president's residence at Florida State University. One of my favorites. Small? One of the requirements was "comfortable for 2 or 200. Large Institutional - Classical: Hartman-Cox Architects for the Special Collections Library at the University of Virginia. Thomas Jefferson is a hard act to follow. Harman-Cox and the audience are in awe of the opportunity, a classicist's dream. Large Institutional - Traditional: Hartman-Cox Architects for the Gothic Duke University Divinity School Addition. Residential Multi-family: de la Guardia Victoria Architects & Urbanists for Almiria Row, a townhouse project in Coral Gables. I'd seen this on the web before. I loved it. When the slide appeared, I gasped. Your results may vary, this one seems very humane and timeless, if over my budget. Residential Under 4,000 Square Feet: David Jones Architects for a relatively small Greek revival home in Washington. I'm a sucker for Greek revival. My favorite. Praised as an example of classicism on a small budget. The house may be relatively small but not the budget. Wonderful. Residential 4,000-10,000 Square Feet: David Jones Architects for Locust Hill, an 8,500 square foot home that fits into a modestly scaled neighborhood. One of my favorites in spite of it's hugeness. It is a series of attached masses, as if it had been added to over time. The facade is elegant but modestly sized and approachable. The bulk of the house extends towards the back. The architect who accepted the award (was it David Jones?) said he wanted only grass and trees, no bushes and found a landscape architect who agreed. I like that. Residential Over 10,000 Square Feet: Harrison Design Associates for a huge five-part Georgian. The house is broken into smaller masses so it's not quite as intimidating as it might be. Beautiful and impressive. I'll be there next year if I can get a ticket. Misti of Studio M Designs is having here "Here's Your Sign Link Party" This is a word based art, but not really a sign. I tried to find sayings related to home an family. Julia over at Hooked on Houses is hosting her "Hooked on Friday's" blog party. This is my second try. I didn't get folk art. I never really thought about it until we bought a home cooked dinner at our elementary school's auction. That was a while ago. Our hosts were collectors. Over their fireplace was a Howard Finster portrait of Henry Ford. You may know that Mr. Finster regarded Ford, Elvis, and a few others as special gifts from heaven. For me it was uncanny. I almost shiver thinking about it even now. But this is about angels. Atlanta's High Museum has collection of Georgia folk artists. We visited for Christmas 2006 to see the Louvre collection. 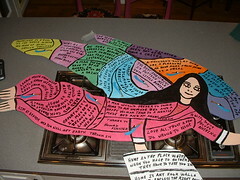 We were on the way out, we made a turn and there was a giant Finster angel. Your results my vary but I was moved. I decided to make one myself. (As man with no qualities, my family thought I was nuts; but they humored me.) Here she is hovering over our porch. (If you know Flickr.com you can make these pictures bigger). We can see her from the kitchen, the dinning table, some of the living room. She gently dominates the porch. She greets me every morning as I climb the stair up from bed. I like to think she's protecting our home and family. She came together from a picture on the web, then in Photoshop, tracing on leftover plywood, the garage with my jigsaw and sander, finally on the range with my son's acrylics. I found sayings related to home and family. She wasn't done yet. Of course there is no duplicating Finster. There was something in him that flooded out. But I enjoyed doing it. I hope I've honored him. I get to see her every day. Click here to return to Hooked on Houses' "Hooked on Fridays" blog party. But if you aren't tired yet, here is a slide show of public folk art in Atlanta, created for the 1996 Olympics. Architecture tourists know that it's on a forlorn expressway bridge only seen from cars at 45 MPH. I went on foot last Sunday to take these pictures. It's worth a blog post some day. You can make the show full screen by clicking on the lower right corner. You should. This trademark Neel Reid entrance is the fruitiest in Atlanta. These are the Phelan Apartments. With the Palmer House next door. They make the intersection of Peachtree Place and Peachtree Street one of the best corners in Atlanta. Architecture tourists won't be distracted by the new midtown skyline. Peachtree cruiser - everybody should be a Peachtree cruiser - will catch the Phelan as they wiz by and wonder. Personally, I love the fruit. The Phelan is from 1915. Several early apartmetns remain in midtown, many are gone. It's a not so big building. Here is another little post about the Palmer House. From the picture you can't tell that this house is on a busy street in an impressive neighborhood. The lot is small but the setting is a spacious mini-estate. Gravel drives curve around. Click here to see a big picture. Additions on the back preserve the perfect proportions of the facade. They don't build houses like this in any neighborhood. Unless this one is historic, it's doomed. But this is the one house on a long drive east from Morningside the makes me feel good every time. It's easy to impress with bigness, expensive details, extensive landscaping, appeals to modern tastes. But you don't often get charm. Small spec homes are cheap and usually look cheap. Folks building custom homes build big, impressive, and to the trends. I guess that's the safe thing. Since my Cape Dutch and Dutch gable epiphany I've been searching. Here are scrolls on a mission revival parapet - if that's the term - on the edge of Druid Hills. If you find this one, slow down or you'll miss much high-styled detail. Awnings, urns, tile, blind arches, lanterns, curved walls - wow! The shady north facade with lamp post, arches and walk. Yummy. A few Atlanta neighborhoods have tiny pockets of mission or Mediterranean eclectic houses. This one is across the street from the scrolled gables. Very dignified but inviting. The "garden growing wild" over grows the walk. Please keep the edger away. Lot's of curvy details in this Morningside mission near Ansley Mall. There is a cartouche in the gable and another great awning, this time with tile. Next door we have a bell gable. Good grief there is a Cinquefoil, and serpintine columns. What is a bell gable? Head over to Virginia-Highlands' Church of Our Saviour to see. We see Dutch / parapeted gables in new construction. This one is in the Old Fourth Ward west of Atlanta medical center. You'll never see these houses unless you live in in the neighborhood. Architecture tourists - keep your eyes peeled. The Equitable Building paradox: the wonderful plaza and mezzanine use Design Pattern 114. It's big, black, and boxy but not without charm. The huge "Equitable" sign at the top is an Atlanta landmark. From a distance, it's not very pretty; but the closer you get, the more humane it feels. I've passed here 1000's of times. It feels good somehow. Architecture tourists will find people there! Linger a few minutes on the plazza and take the escalator to Kinkos. These days, we wouldn't tear down the old building, but at least they saved a few of the columns. There is a comfortable plaza out front. The columns, fountain, art, street tables give it a human scale. There is an arcade where you can get out of the rain. It softens the feeling. In decent weather, you'll find people there. It's the most comfortable outdoor place on Peachtree downtown. In fact it's the only place that tries. Isn't the brickwork nice? I revisited the building this week because there used to be a busy cafeteria on the Mezzanine. There is a Kinkos and an empty restaurant there now but the space is still magic. The only place like it is the restaurant at the Ritz Carlton: a view and connection with the street. The cafeteria was a bit more democratic. Anyway, in the 70's before MARTA construction trashed downtown this was great destination for lunch. Here is an indoor place that fits Pattern 114. Even my poor photograph shows how good this place feels. Here are some views. The Rhodes-Haverty, Georgia Pacific, and Chandler Buildings. The Flat Iron Building is the gateway to the Farlie-Poplar district. Central City Park, the Hurt Building in the background. The scaffolds protect the sidewalks from tornado damaged windows. At the corner of Highland Avenue and Boulevard, just north of Freedom Parkway and the MLK Historic District colored shadows crawl over the facade. The chips defy gravity as they float above the wall. The chips and shadows reward viewing from all angles, distances, and times. I like it. Who is the artist? Highland Avenue at Boulevard, Atlanta Medical Center, Atlanta, GA "
If you click on the lower right corner of the slide show you can make it full screen. Please do. Julia over at Hooked on Houses is hosting her "Hooked on Friday's" blog party. I don't get invited to many parties so here we are for the first time. I get tired of the dramatically staged, perfectly lit, everything in it's place, and often sterile decor pictures, don't you? We're doing it for our families aren't we? You'll have to scroll way down for tasteful lady arm wrestling. or with having best buds over for dinner. You have to scroll even further for tasteful lady arm wrestling. and we've eaten until we're bloated and a little sleepy-eyed. If you know a little about Flickr, you can click these pictures to see some slide shows. But tasteful lady arm wrestling is a hard act to follow and I know you're busy. P.S. Jamie beat Rachel both right armed and left armed. Click here to return to Hooked on Houses' "Hooked on Fridays". blog party. Dutch gables, Cape Dutch architecture in Atlanta?